The other day, I had the opportunity to speak with composer Alexandre Desplat. His score for The King’s Speech (in theatres now) is nominated this Sunday for a Golden Globe. I spoke with him about both that film, as well as a score he did for another film this year, The Ghost Writer (now on DVD). Both are excellent films that if you haven’t already seen, you should seek out. For now, enjoy the following. The interview is pretty much spoiler-free. What was it like working on these projects? In terms of The Ghost Writer, Polanski is one of the talented figures of cinema. Part of his very special approach how to use music can be compared back to his very first films – the way he uses it, decides where it starts and ends. In this case, it was interesting, because 2/3 of the score, he couldn’t hear, because he was in prison. For a composer, it’s very unusual that you write big chunks of music without the director reviewing it. A large portion of the music for the final scene was written without being able to have the feedback of the director. But it went well. With The King’s Speech, the film is about someone who can’t express themselves easily, and the music had to express exactly that. The emotions he can’t show, the words that he can’t pronounce. When you put it together, you are finding deep emotions out through the music. You feel the sense of stuck when the melody can’t move forward, and then with repeated notes as it finds it’s way. Now, The Ghost Writer was based on a book, and The King’s Speech on history – how much did you know about these stories beforehand? Well with The King’s Speech, I only knew that the king had abdicated and George VI had succeeded him. I had no idea he had a speech impediment, or a speech therapist. I don’t think a lot of people had realized this. I think that makes the film all the more interesting to watch – it is about a little known piece of history. Yes, and I must say, that in France during WWII, when the newspapers would write about what was going on, the names that they would always mention were Chamberlain and Churchill. When you’d learn this history in France, when they talk about England, I don’t even remember them mentioning much about George VI. It was always Churchill and Chamberlain. It’s like outside of England from the perspective of other countries, the Prime Minister is almost more important than the king himself. As for The Ghost Writer, I knew there was a book, and I knew how it was sort of based on similar things that had actually happened, such as with the war in Iraq. I also knew about the CIA and these kinds of things that I think the story was really about. I had not actually read the book though. How do you think the musical style adds to the finished films? What I can say on The Ghost Writer is that it had to bring a lot of energy and uncertainty, which you hear from the first piece of music. It’s always on the edge, like when he is flirting with Ruth (the wife of the Prime Minister), because it couldn’t be just a love story. It had to be always strange and mysterious and that came out in the music. In The King’s Speech, I think I tried to capture kind of the whole therapy George (Firth) went through with Lionel (Rush). A lot of the therapy was based on things that had happened in his childhood, going deep into when, how, and why this speech impediment started. Because you’re not born with it – it usually comes out around 4 or 5. So thinking about that, I tried to bring a lot of elements in to make the audience feel like we are diving into his memories. Sometimes childlike. George has to face big history in the film though – not just his own and the orchestra gets bigger and the scope gets bigger. Another thing that helped, is we found the royal microphones that George VI had always used for his speeches, so using them for the recordings, we create another sense of intimacy knowing you have the sound contained by this, and it creates even more of the sensation of inner space. Who’s idea was it to use the Beethoven selections during the end scenes of The King’s Speech? It was Tom’s. Tom Hooper decided to use that. It was a temp track at first, but I said, there is no way I was going to replace Beethoven. It worked marvellously, and it made sense since it has such a universal quality to it. I would never have been able to compete with that. Another thing that’s interesting, is that during the war, to signal the beginning of a coded message, the French Resistance used the first few notes of Beethoven’s fifth symphony – you know the part that goes ‘da da da dum, da da da dum…’ It became the jingle for the messages, so it’s all connected. It made no sense to rewrite that. It’s universal beyond countries and cultures. Human beings for over hundreds of years have known it. Also, you bear in mind that Lionel Logue used to play the classical pieces, Mozart, Brahms, Beethoven, etc. I personally found the overall tone to the music in The Ghost Writer to be reminiscent of Bernard Hermann’s work with Alfred Hitchcock. Was this conscious at all? No, I never even thought of that. Well, he is one of my favorites, and one of many influences to music, but you could say that it’s just this kind of film where the music has so much, and you’re using a classical orchestra that leads it to remind you. …how do you mean exactly? It is true that you could say that the main character of the story could make us think of Hitchcock’s, because he’s a fish out of water, who takes us many places. From one side there is a connection with Hitchcock movies, but the way Polanski uses stretches of time slowing it as an almost sudden event – that’s very different from what Hitchcock did. There is that kind of story, a classic one, and in a sense maybe Roman has thought about that, or maybe that’s also just because of the genre. We’re running short on time here, so is there anything else you’d like to add before we wrap up? I wish Roman’s film had gotten more attention. You know, I didn’t read one article last year that didn’t mention his private life. It makes a big confusion, and it is not very useful for anything in terms of the film. And for The King’s Speech, we are lucky to have a young master as a director, who has huge potential in the coming years. Are there any other projects that you can mention you’re working on right now? Well, not many I can say about, but there is the last bookend to the Harry Potter series which will be out this summer. Thank you for taking the time to talk with me today. Thank you – it’s been a pleasure. 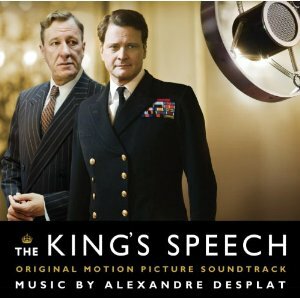 Alexandre Desplat’s score for The King’s Speech is nominated for a Golden Globe – watch the awards tomorrow night at 8:00 pm EST. Both the CD’s for The Ghost Writer and The King’s Speech are available now, wherever music is sold. I find that interview very interesting. I wondered why they chose the Beethoven in ‘king’s speech’ for the main ‘speech’ itself….100% agree with you on ‘ghost writer’ being like ‘North by Northwest’ a very good score I think.